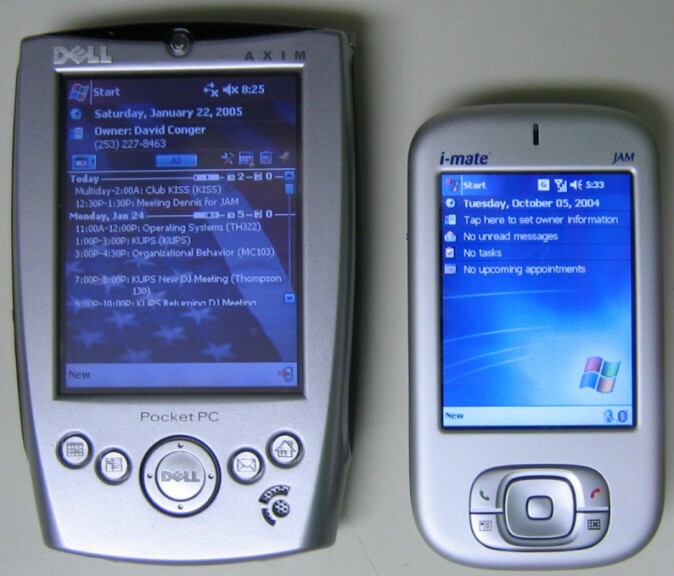 Until recently, Pocket PC and Pocket PC Phone Edition devices had to have screen of between 3.5" and 4.0". The i-mate JAM (HTC Magician) is the first device to scale the screen size down while keeping the standard 240x320 resolution. The screen is only 2.8" diagonally, making its size dramatically smaller than any of its Pocket PC Phone Edition competitors. This makes the JAM a sleek and small device that is not much bigger than an average cell phone. 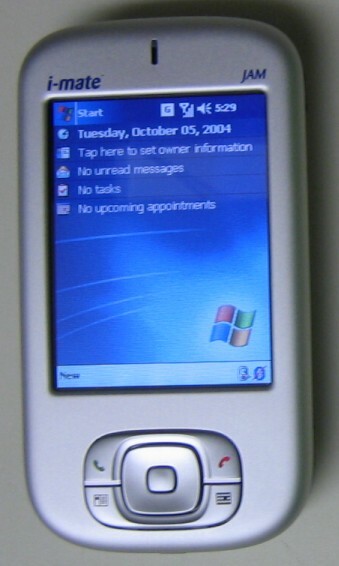 The JAM still packs all the features of Windows Mobile 2003 Second Edition for Phone Edition with a similar user experience. 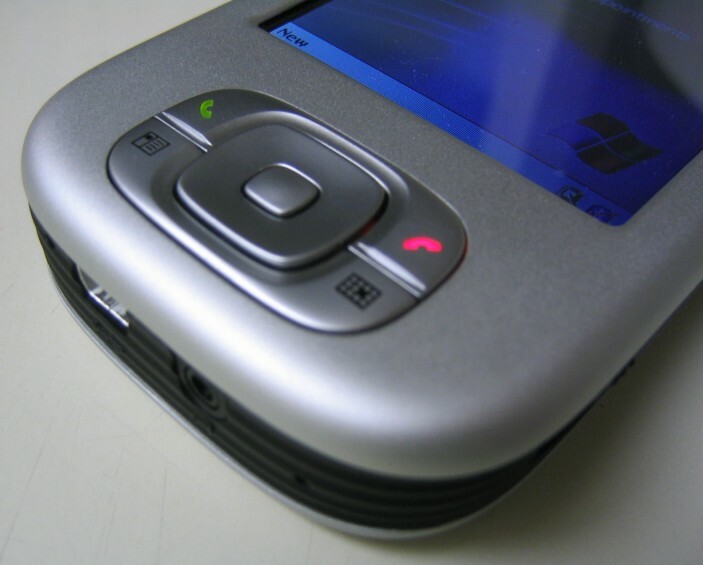 The JAM is the first Pocket PC Phone Edition device that actually has allowed users to replace their phone with a PDA/Phone combo device that does not require huge pockets. A special thanks goes out to "Convergent Technology", who has continued to supply me with i-mate products to review. 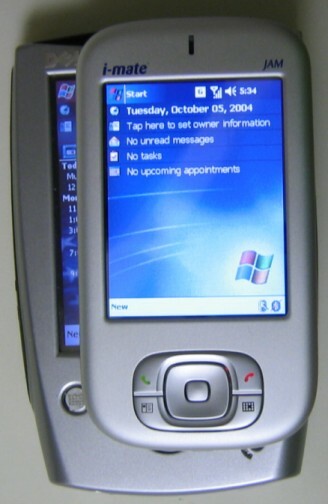 The i-mate JAM is built around the Intel Bulverde (XScale) processor running at 416 MHz. The device is powered by Windows Mobile 2003 Second Edition, and provides 64 MB of RAM and 64 MB of ROM to the user. 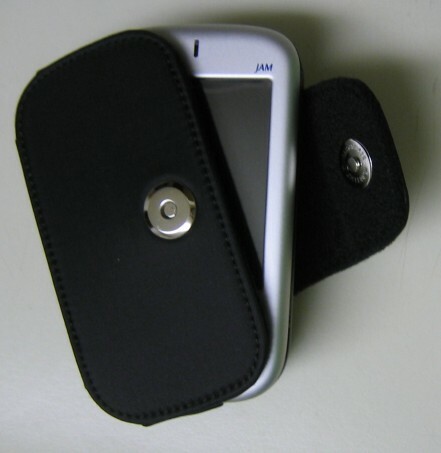 The JAM is a PDA/Phone combo device and includes tri-band GSM/GPRS wireless. Also included is Bluetooth and an SDIO slot. The battery holds 1200 mAh of power and the screen displays 16-bit color at 240x320 pixels but is only 2.8 inches. 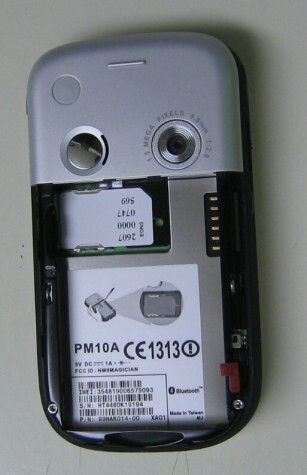 The device includes a 1.3 mega pixel camera. It is 4.25" x 2.28" x 0.71" and weights 5.29 ounces. In some ways, the JAM looks like a mini PDA2k. The front face has a metallic finish on it and is rounded on the corners to create a sleek look. The screen takes up most of the front face of the device, with the speaker for the phone at the top and a simple set of buttons grouped together at the bottom (two buttons for phone control, two quick launch buttons, and a rounded square directional pad with a separate action button). On one side of the device is the power button, IrDA port, and the stylus, which is rather hidden in the groves on the sides. The sides are grooved for gripping. Personally I would have rather had the power button on the other side as when I was holding the device, I tended to want to press the power button with my right thumb instead of my pointer finger. The other side has the up/down control and two buttons, one for camera controls and the other for voice recording or quick launch. The up/down control is a particularly awkward slider and I did not find to to be very useful for navigation. Instead I used the more powerful directional pad. On the top of the device is the SDIO slot as well as a spot to hook a wrist band if you are worried about dropping your device. The bottom of the device has a standard mini USB port for syncing and a port for a headset. On the back of the device is the 1.3 mega pixel camera with mirror and the removable battery with a SIM card slot underneath. In all, the device is about the size of my palm. I have big hands, but for most people the size of the device makes it very easily graspable, especially in comparison to larger Phone Edition devices. Initially, the JAM does not exactly look like a PDA. It seems a little too small to actually be a Pocket PC device...though maybe that is just because I am so accustom to "larger" devices. At first you may expect it to simply have a lower screen resolution, allowing for less to appear on the screen, but the resolution is the same so the same amount can fit on the screen, but it is just smaller than a standard Pocket PC screen. While this nice for size, it can create some problems with it comes using the JAM as a PDA. The JAM is very easy to hold which makes it good for being able to write and tap, but the smaller screen means precision is important. It takes some getting used to to be able to tap precisely on some of the smaller buttons. Also, if you plan to use a writing converter like Transcriber, the screen size is significantly reduced so less can be written before space runs out on screen. I sometimes have problems writing big words on a standard Pocket PC's screen, so I had similar trouble with the JAM, but at least I was able to use the functionality of Windows Mobile 2003 Second Edition to turn the screen into landscape mode. The on screen keyboard has the numbers removed to make the keys bigger for tapping. Also some of the other keys are moved for the same reason, so going from a "larger screen" Pocket PC to the JAM can be slightly confusing if the on-screen keyboard is used as the input method. One thing that makes the JAM a very appealing device as a phone is the size. Until the JAM, PDA/Phone combo devices have been rather larger, especially in a comparison with a standard cell phones. The size of the JAM makes it very easy to hold, even in a long conversation. Its weight is about the same as a standard cell phone. When using it as a phone, I found that it was a little difficult to find exactly where the speaker was in comparison to my ear. 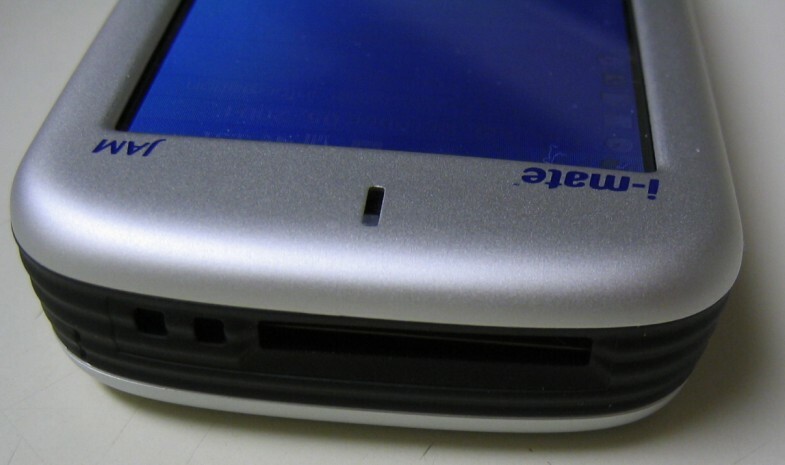 After using the PDA2k which has a very defined speaker, I would have hoped i-mate would have made the speaker more than just a little slit at the top. My standard cell phone has a speaker that is simply a slit and I hate it. However, the sound quality of the JAM is pretty good. You can hear relatively clearly. The microphone is also good and well placed for getting a good signal back to the person on the other end of the line. The unprotected screen was mildly problematic because users like me which hold the phone up against there face may tend to tap the screen while talking. Also the screen would get oils on it which had to be wiped off. This can of course be remedied by not holding the phone as closely your face, but it is something to be aware. Another method for solving the problem is to use a headset. The JAM come with a stereo headset, but before trying that one I tried a mono headset I had from another Smartphone. Interestingly, it did not work like it should have as the JAM still used its own microphone (not the headsets) and after eight minutes the call was disconnected. A very interesting bug to say the least. The JAM does not have a button keypad like a standard cell phone which means all dialing must be done from the touch screen. In some situations I found having to dial on the screen, particularly on the small sized screen of the JAM, annoying. Dialing by contacts is another method for dialing. I found this to be a lot better method for calling at least the known contacts. The i-mate JAM includes one SDIO card slot, which allows primarily for memory and WiFi expansion cards. I used the SanDisk Connect 256 MB + WiFi card for connecting the JAM to my WiFi network when I was at home or near and access point. This allowed me to use WiFi instead of the cellular data networks. It would have been nice if they WiFi were included like the Bluetooth, but I suppose there need to be something to add in the next edition of the JAM. What I do like is that SDIO was included as opposed to miniSD like with the i-mate SP3 and SP3i Smartphones. This makes it easier to add expansions other than just memory. Bluetooth also helps with expandability. I was able to use the JAM with a Sony Ericsson Bluetooth headset instead of having to use the included wired connector. While the camera is a 1.3 mega pixel camera, it is only 4.8mm which means it has a very small lens. This makes picture clarity not great, but ok. It is good enough if are viewing the pictures on the device, but the pictures are not really of printable quality or viewing on a larger screen. 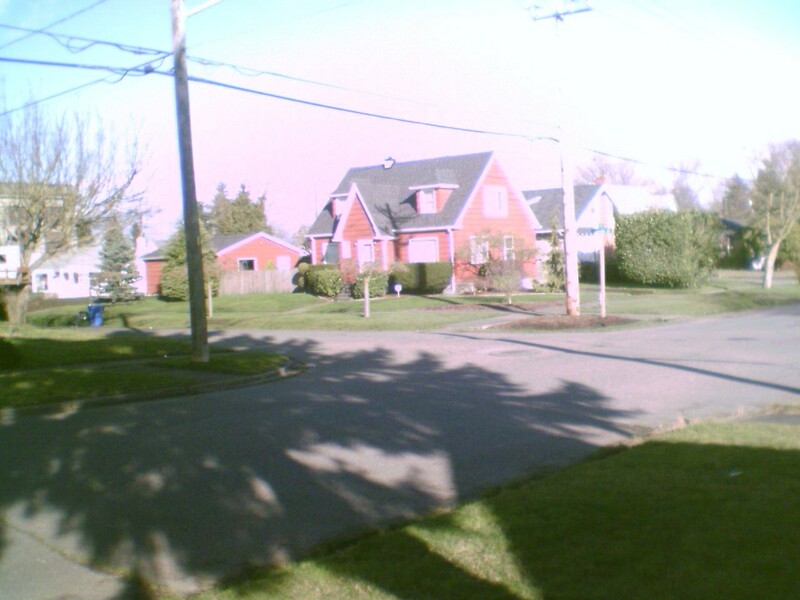 While it is a Pocket PC device and not strictly a phone, the camera quality is about the same as any other camera phone. Below you can see examples of two pictures I took. The first was taken indoors and the other outdoors. One thing that is really cool about the camera on the JAM is the software that comes with it. 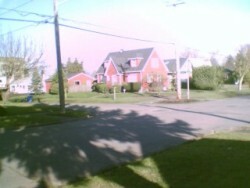 The camera application runs full screen. No task bar at the top, completely full screen, making the whole screen one big view finder. This makes complete sense because Pocket PC devices have such large screens, the whole thing would really be utilized instead of just a small portion. Screen readability is very important, and with the smaller screen size on the JAM, there is a question if the screen is big enough for easy readability and quality. One nice feature is the ability to change the font size. Because the resolution is the same as other Pocket PC devices, the same amount of information will fit on the screen, but it will all just be smaller. 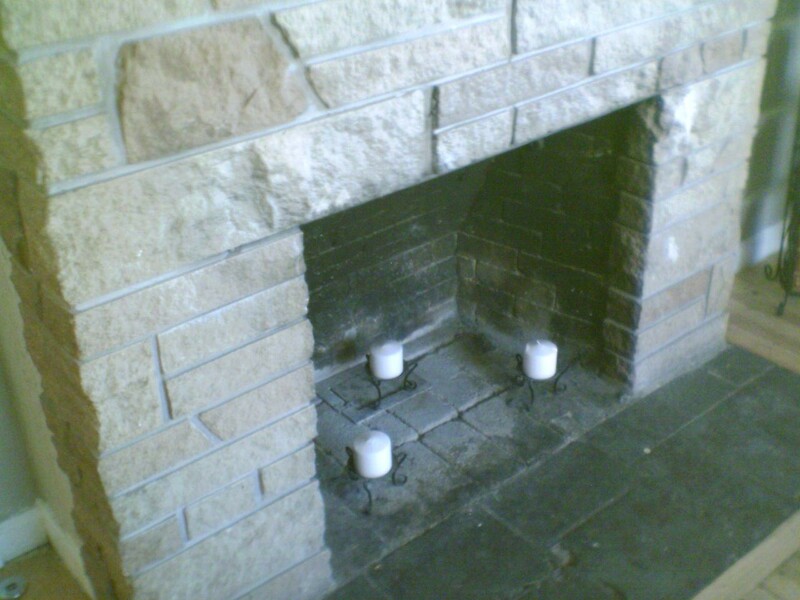 This does mean that the quality is better as there are more pixels per inch. The screen is very vibrant, which is important at least in my book. It is also important to me that I can run my device with a slightly lower brightness level than the top setting. I was able to do that with the JAM successfully in almost any conditions. The only time my screen was at full brightness was when the camera forced it to be. This also means a better battery life for the device. Power was not a major problem while using the JAM. I was able to use the JAM for about three days with moderate use. If I was using it more throughout the day and working on WiFi networks with an additional SDIO card, the battery life would of course be less. Unlike many devices currently on the market, the JAM using a standard mini USB connection for both power and syncing. When doing the review I did not even need to take the cable out of the package since I already had one for use with another device. While you cannot connect USB accessories, I think it is important they used a standard connection type that is not proprietary to only the JAM or the i-mate product line. Also included in a box is a simple case, which is great for a variety of applications. It is almost exactly the same as the case for the SP3. Some may not like it because it can be hard to get the device out of the case as it holds it in very tightly. Finally, on the device there is additional software, including modem software (to use the phone as a modem), fax software, xBackup, and photo contact software. The i-mate JAM packs a powerful punch and puts a huge dent in the PDA/Phone combo device market. The JAM is small and sleek, fitting most users size requirements, and features a full resolution touch screen with all the power of Windows Mobile 2003 Second Edition. The device does not include WiFi, which many users may not like, though expandability options are available to add WiFi to the device. The JAM was a well thoughtout and successfully deployed product. It fits a need in not only the PDA/Phone combo market, but also in the general PDA market as well. Priced at just under $650 at retailers like "Convergent Technology", the i-mate JAM is a relatively expensive device in the PDA market, but an extremely competitive device in the PDA/Phone market. You will likely not find a better device for the money that is able to fit as easily into your pocket as the i-mate JAM.